GAWKER IS REPORTING THAT MANATEES ARE DYING OFF. Excuse me while I sob uncontrollably. They are my spirit animal. They really are. I had decided this at a fairly young age. My FB profile pic was a manatee for about a year. In fact, 582 of the burly mammals have died so far in 2013—as much as 19 percent of the entire adult population—thanks to a shrinking supply of food and the proliferation of deadly algae blooms like red tide in state waters. ;_; I am so sad right now. 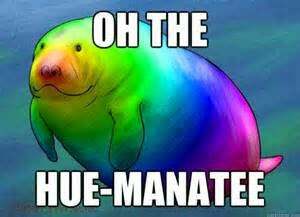 I love manatees (incase you were confused, I just want to clarify). Who do I need to fund to fix this? Bragging rights: When I was 14, I was swimming in Mexico and soon discovered I was sharing the lagoon with a manatee! IT WAS MAGICAL. I loved him/her/my kindred spirit.